Ice accretion effects are mitigated during aircraft design using computer codes such as LEWICE. The characterization of convective heat transfer from surfaces with ice roughness is a significant area for improvement of these codes. Funded through a NASA collaborative agreement, the effort focuses on the measurement of convective heat transfer to flows over surfaces with realistic ice roughness properties. The project consists of three primary tasks: 1) measuring the convective enhancement of constant freestream velocity flows over surfaces with realistic ice roughness, 2) measuring the convection heat transfer of flows interacting with the leading edge of an aircraft wing with realistic ice roughness, and 3) measuring the convective enhancement of stagnating flows over surfaces with realistic ice roughness. The project efforts are supported by collaborative activities at the Icing Research Branch at NASA Glenn to measure ice roughness exhibited by airfoils experiencing short-duration icing events. Secondary efforts of the project involve the evaluation of ice roughness properties from three-dimensional laser scans of iced airfoil surfaces created in the Icing Research Tunnel at NASA Glenn. The ultimate goal of the effort is to implement new correlations or advanced approaches for predicting convective heat transfer from realistic ice roughness distributions in current and future ice accretion codes. 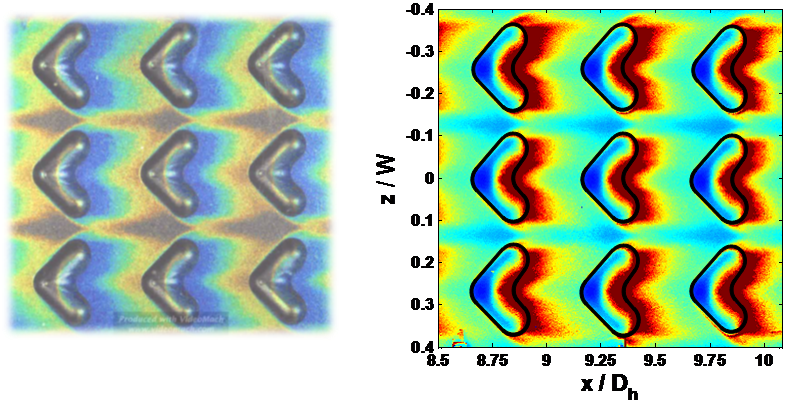 Researchers are building on traditional two-dimensional particle image velocimetry (PIV) methods to obtain planar, three-dimensional flow-field maps using stereoscopic particle image velocimetry (S-PIV). Two high speed, high resolution cameras are used to fully characterize both internal and external, turbulent flows. S-PIV has proven to been an effective tool to quantify the turbulent parameters associated with three-dimensional secondary flows induced by boundary layer injection (film cooling) or period surface roughness elements. In addition to quantifying turbulence, it is vital to understand the thermal boundary layer development associated with various cooling configurations. 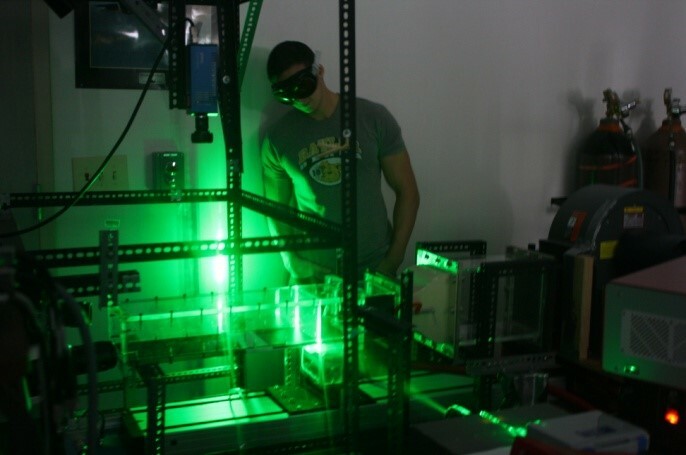 Researchers at Baylor are using Planar Laser Induced Fluorescence (PLIF) to obtain detailed temperature distributions within highly turbulent, gaseous flows. By mapping the temperature gradient within the thermal boundary layer, it is possible to fully characterize the performance of both film cooling and turbulators cooling techniques. To maximize the power output and efficiency of gas turbine engines, their operating pressures and temperatures continue to rise. To ensure the engine operates reliability under these conditions, the turbine section of the engine must be cooled. Baylor has a unique facility that allows researchers to quantify the effect of rotation on internal, turbine blade cooling. With the ability to simulate engine conditions, the effect of both the rotation induced Coriolis and buoyancy forces has been measured for both channel and jet impingement cooling. External cooling of gas turbine engines involves the use of film cooling. Both the turbine airfoils and combustor liner are outfitted with small holes where cooling air passes from the inside of the component to the outside. As the cooling air exits the hole, it forms an insulating, film layer on its outer surface. To minimize the amount of cooling air required to adequately protect the hot sections of the engine, the film cooling geometries must be optimized. Researchers have the ability to measure surface temperature distributions using temperature sensitive paints (TSP), thermochromic liquid crystals (TLC), and pressure sensitive paints (PSP). The figure shows the surface film cooling effectiveness distributions measured from PSP using a heat-to-mass transfer analogy. Theses surface measurements have been coupled with S-PIV measurements of the flow field to see how the coolant interacts with the mainstream flow to yield these surface distributions. With gas turbine cooling, heat exchanger design, or electronics cooling, designers are continuously searching for methods to enhance convective heat transfer to or from a surface. Periodic surface roughness elements have proven to trip the flow near wall and increase heat transfer from the surface. Using advanced measurement technology such as fluorescing temperature sensitive paint (TSP) or hue-based thermochromic liquid crystals (TLC), researchers are able to quantify the heat transfer enhancement afforded by surface roughness elements. The figure shows the heat transfer coefficient distributions obtained in a transient liquid crystal experiment on a surface lined with V-shaped dimple depressions. These techniques have also been used to optimize jet impingement on a curved surface, applicable to leading edge impingement within a gas turbine blade. fferent fields of study, leading to new and novel solutions for complex problems. ects on vehicle stability are particularly important for high-speed cruise applications and will increase trim loading and decrease ballistic trajectory accuracy. A fundamental physics-based understanding of the laminar-turbulent boundary-layer stability and transition process at both hypersonic and lower speeds is crucial to next-generation vehicle development. Such understanding will result in smaller vehicle design uncertainties and come from the development, validation and introduction of new and more advanced physics-based stability and transition prediction tools. As part of the Nation Center for Hypersonic Laminar-Turbulent Transition Research, I develop the JoKHeR nonlinear parabolized stability equations code, which allows for numerical investigation of the physical processes underlying the stability and transition problem. cantly inhibits fate and transport predictability of ocean pollutants. I believe targeted bottom boundary-layer observational programs are required to appropriately resolve this limitation in current numerical ocean modeling techniques. Flow separation is becoming an increasing problem in highly loaded turbine blades. 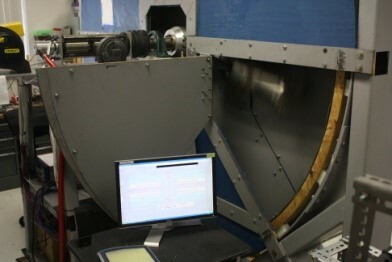 A gas turbine suction surface simulator has been developed for the Baylor University low speed wind tunnel. A contoured top wall in the test section enables the pressure distribution to be simulated on flat plate that corresponds to actual separated flow conditions. Techniques to stop separation will be studied as well as the impact of separation on heat transfer (using a steady state gold foil liquid crystal technique). Comparison will be made with the CFD code Fluent. A new experimental facility developed at Baylor University will enable the study of local heat transfer coefficients beneath impinging jets, a technique used to cool gas turbine blades. This research uses the transient liquid crystal technique. In addition, a two-axis hot-wire anemometer traversing system will be used to map the impinging jet flow field interaction and this will be modeled in the CFD code Fluent. An experimental facility has been developed to model arrays of fins looking at pressure drop and heat transfer with different fin configurations. The experiment uses a transient liquid crystal hue technique coupled with a finite element analysis of the fin to determine the local heat transfer coefficient on the fin surface. Comparisons will be made with water tunnel visualizations and CFD using Fluent. This work is sponsored by Dr. Nicole Okamoto, San Jose State University, and Dr. Ken Van Treuren, Baylor University. Using the Baylor University wind tunnel, active and passive turbulence generation grids will be evaluated with down stream measurements of turbulence made using a two axis-hot-wire anemometer. Particular attention will be given to length scales "designing" the turbulence for specific flow conditions. A boundary layer can form when a fluid flows above a solid surface. Boundary layer flows can be found in many applications, from the thin layer above a microprocessor which contains a lot of heat produced by the processor to the large scale layer as vast as the planetary boundary layer above the earth surface. This work is to understand the transport and mixing process of irrotational fluid into rotational fluid in turbulent boundary layer. The purpose is to learn how to improve or hinder transport of heat, mass, or momentum into the boundary layer.